Winzarten released the first version of a new Telemetry Viewer app named “Second Monitor”. Currently, the app is available for free at the Github development platform. 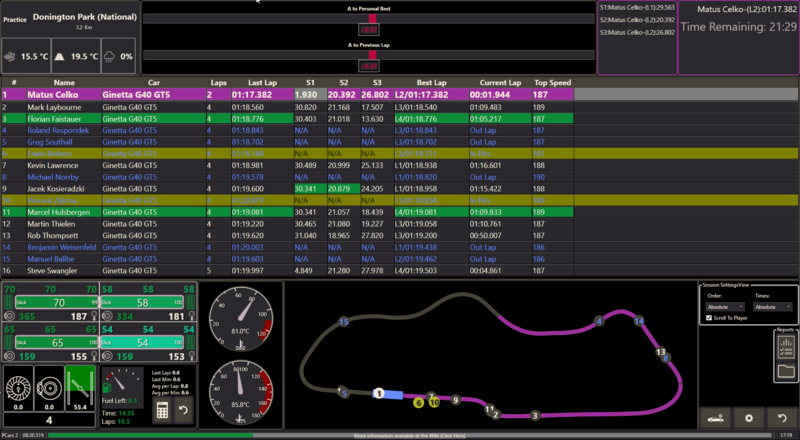 Second Monitor is a Timing/Car information application for racing simulators. It displays real-time session information, timing information and basic car status indication. Aditionally, Winzarten now added a Telemetry Viewer app, that allows you to capture and analyze data from most of the popular Sims. Currently, the app supports Assetto Corsa, RaceRoom, Project CARS 2, Project CARS, Automobilista , rFactor and rFactor 2. 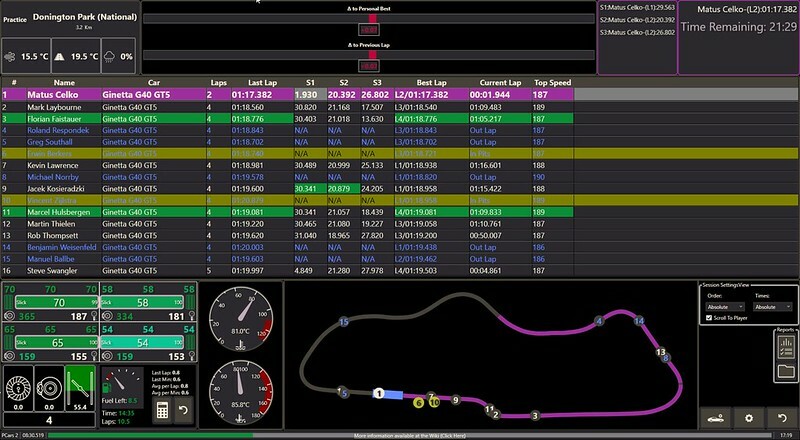 Pit information – in practice/qually it is a simple “in/out”, in the race it shows the number of pit stops, and the last pit stop information * Absolute/Relative driver ordering. Timing Circle (ellipse 😀 ) / Track Map: Position of cars on the track. The app needs one fully timed lap for to be able to show the track map. Car Information – Brake temperatures, tyre temperatures + pressures, tyres condition, pedal and wheel position, oil and water temperatures, pedals and wheel position. Fuel Monitor – Monitoring the current fuel levels and average consumption. Offering quick color-coded information if the actual fuel state is enough to finish the session, and what is the required fuel delta. Fuel Calculator – Use consumption from previous/current session for required for fuel calculation. 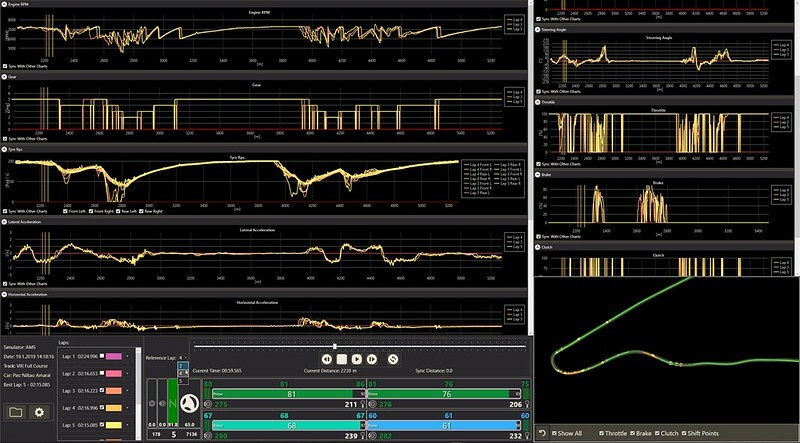 Telemetry Viewer allows to view and analyze the telemetry data that the main second monitor application captures during a session. The data are saved per completed lap and grouped into individual sessions. The basic usage of the application is explained in the topics below. Automobilista – Requires the rFactorSharedMemoryMapPlugin (https://github.com/dallongo/rFactorSharedMemoryMap). Can be automatically installed by the app. This is the same plugin that is used (and automatically installed) by CrewChief, so if you’re using that, you’re good to go. RFactor 1 – Same as Automobilista. Wasn’t tested, but it is the same engine as AMS, and the same plugin is used for data, so it should work. RFactor 2 – Requires the rF2SharedMemoryMapPlugin (https://github.com/TheIronWolfModding/rF2SharedMemoryMapPlugin). Can be automatically installed by the app. This is the same plugin that is used (and automatically installed) by CrewChief, so if you’re using that, you’re good to go. Assetto Corsa – Requires custom plugin, then should be automatically installed when the app detects Assetto Corsa running. The plugin needs to be enabled in the options settings manually.